Keeping these together since the two archetypes are highly related. There's a lot of these so I'm separating them out by Attribute. Basically the idea is that Reigners are summoners while Serviles are their familiars that they command. 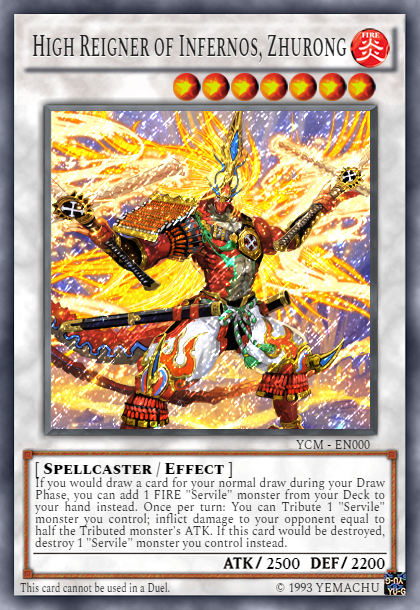 As such the Reigners all have searching effects while Serviles can be Special Summoned if you control a Reigner. Other effects generally are focused on maintaining a field advantage. 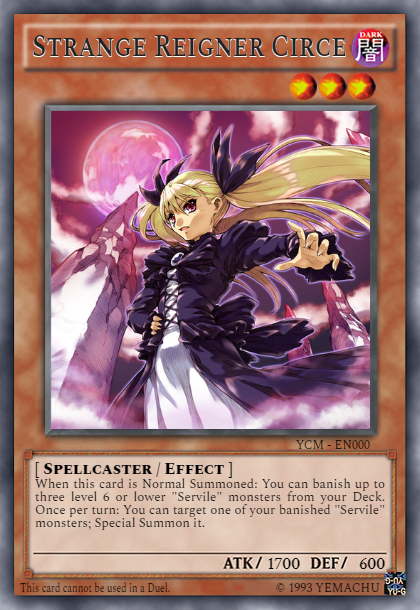 When this card is Normal Summoned: You can banish up to three level 6 or lower "Servile" monsters from your Deck. Once per turn: You can target one of your banished "Servile" monsters; Special Summon it. Once per turn: You can shuffle one "Servile" monster from your hand into your Deck; add one "Servile" monster with the same attribute from your deck to your hand. 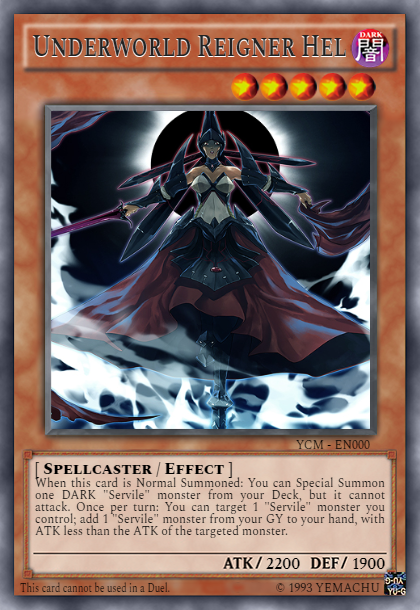 When this card is Normal Summoned: You can Special Summon one DARK "Servile" monster from your Deck, but it cannot attack. Once per turn: You can target 1 "Servile" monster you control; add 1 "Servile" monster from your GY to your hand, with ATK less than the ATK of the targeted monster. 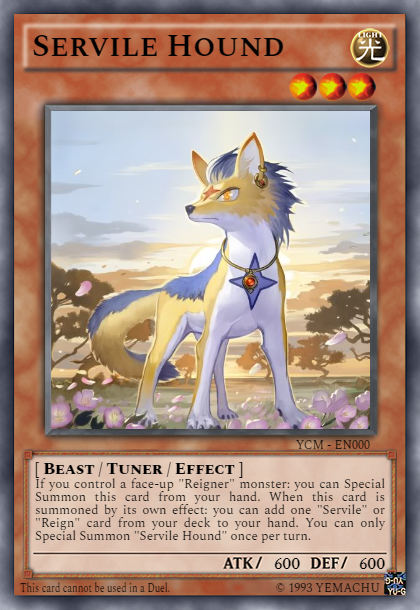 Once per turn: You can target 1 "Servile" monster in your GY, with a Level less than or equal to this card's Level; Special Summon it. If this card would be destroyed, destroy 1 "Servile" card you control instead. When a "Servile" monster is summoned by its own effect: You can Special Summon one EARTH "Servile" monster with equal or less ATK from your deck. 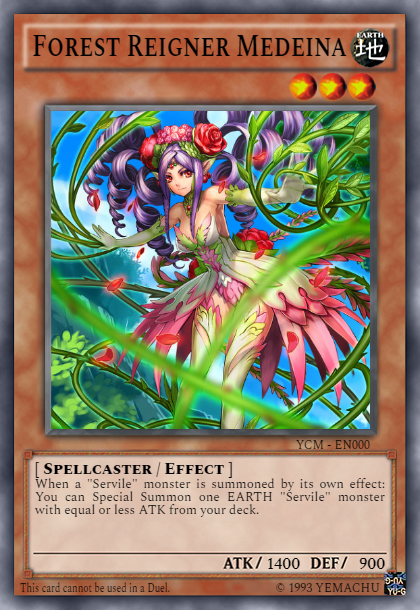 When this card is Normal Summoned: You can add one EARTH "Servile" monster to your hand from your deck. If this card destroys an opponent's monster by battle: You can tribute one "Servile" monster you control; this card can attack again. You can only use this effect once per turn. 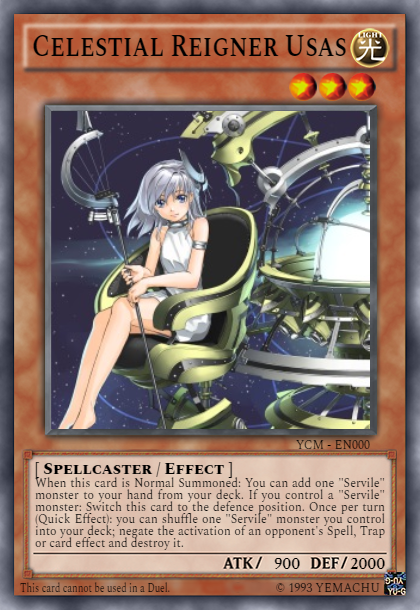 When this card destroys an opponents monster by battle: You can add one "Servile" monster to your hand from your GY or deck. If this card would be destroyed: Destroy one "Servile" monster you control instead. 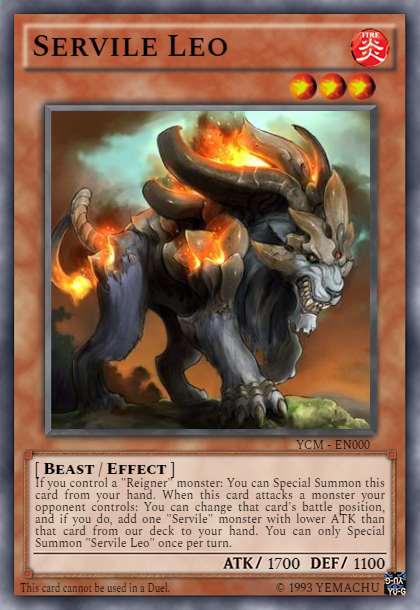 When this card is Normal Summoned: You can add 1 FIRE "Servile" monster from your Deck to your hand. 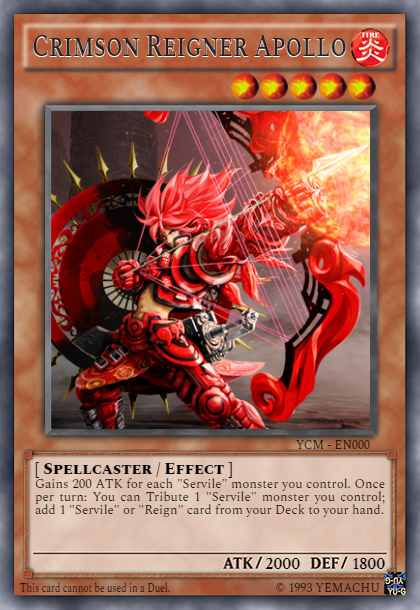 Once per turn: you can Tribute 1 "Servile" monster you control and target 1 monster your opponent controls; destroy it. Gains 200 ATK for each "Servile" monster you control. 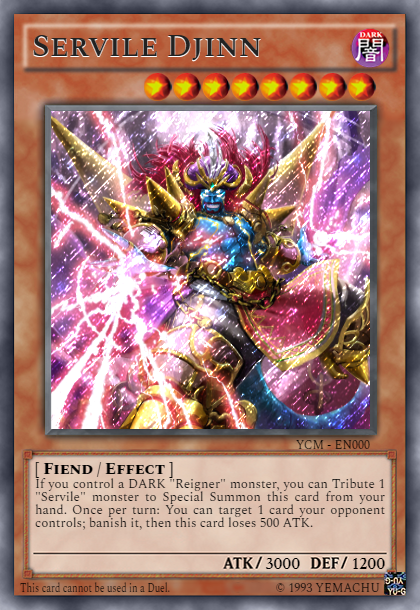 Once per turn: You can Tribute 1 "Servile" monster you control; add 1 "Servile" or "Reign" card from your Deck to your hand. 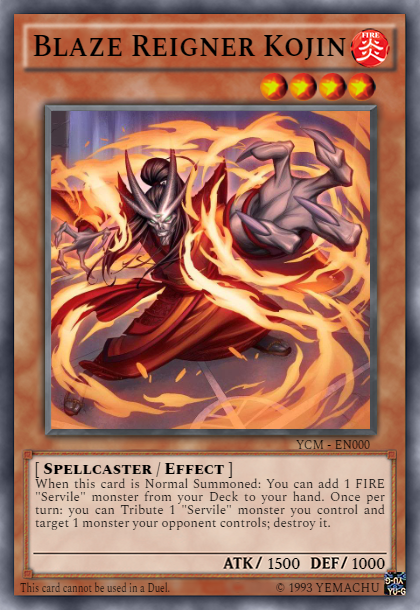 If you would draw a card for your normal draw during your Draw Phase, you can add 1 FIRE "Servile" monster from your Deck to your hand instead. 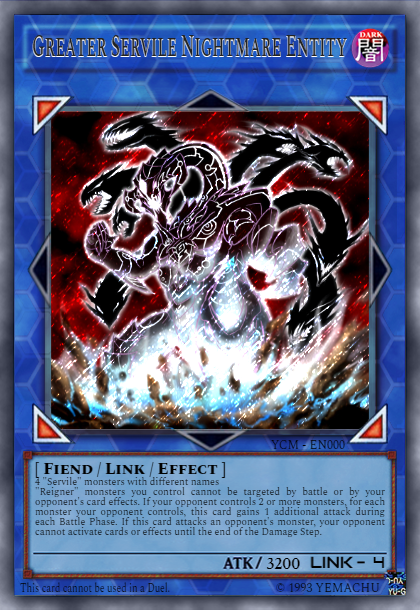 Once per turn: You can Tribute 1 "Servile" monster you control; inflict damage to your opponent equal to half the Tributed monster's ATK. If this card would be destroyed, destroy 1 "Servile" monster you control instead. 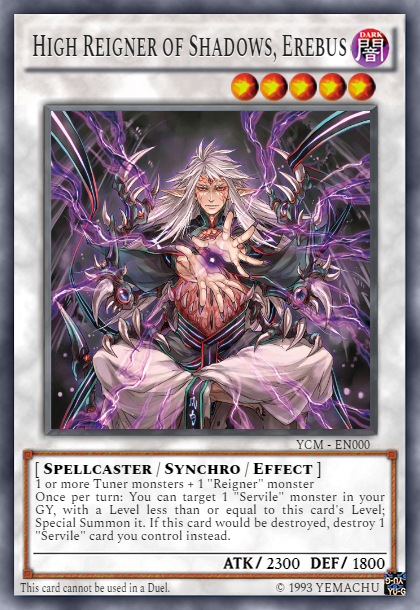 When this card is Normal Summoned: You can add one "Servile" monster to your hand from your deck. If you control a "Servile" monster: Switch this card to the defence position. Once per turn (Quick Effect): you can shuffle one "Servile" monster you control into your deck; negate the activation of an opponent's Spell, Trap or card effect and destroy it. 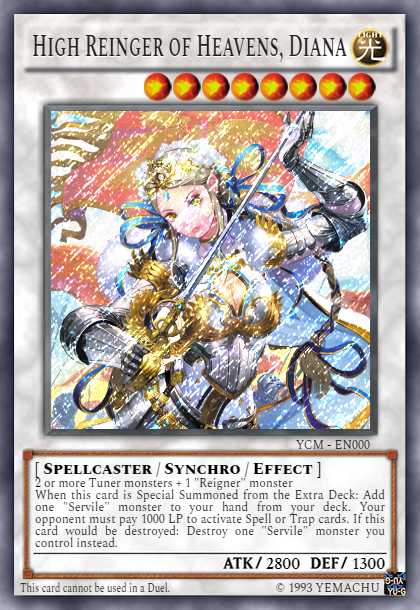 Once per turn: You can add one "Servile" monster from your GY to your deck. If it is a LIGHT monster: You can add it to your hand instead. 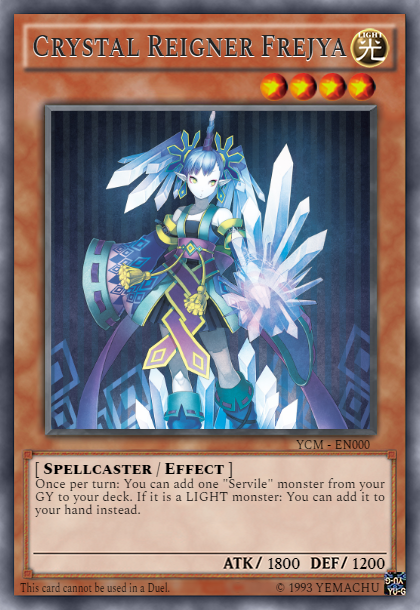 When this card is Normal Summoned: You can Special Summon one LIGHT "Servile" monster from your GY. When this card is Special Summoned from the Extra Deck: Add one "Servile" monster to your hand from your deck. Your opponent must pay 1000 LP to activate Spell or Trap cards. If this card would be destroyed: Destroy one "Servile" monster you control instead. 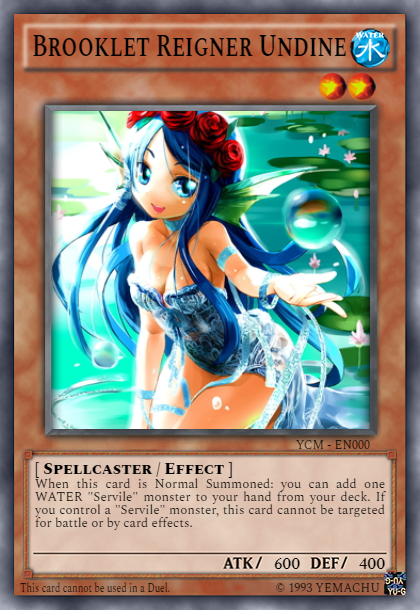 When this card is Normal Summoned: you can add one WATER "Servile" monster to your hand from your deck. If you control a "Servile" monster, this card cannot be targeted for battle or by card effects. 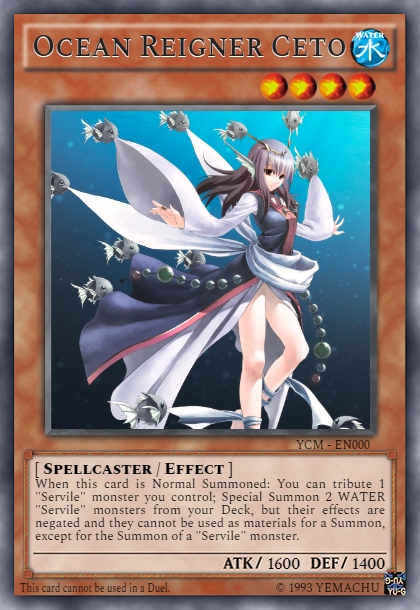 When this card is Normal Summoned: You can tribute 1 "Servile" monster you control; Special Summon 2 WATER "Servile" monsters from your Deck, but their effects are negated and they cannot be used as materials for a Summon, except for the Summon of a "Servile" monster. Once per turn: You can target 1 face-up card your opponent controls; flip it face-down. 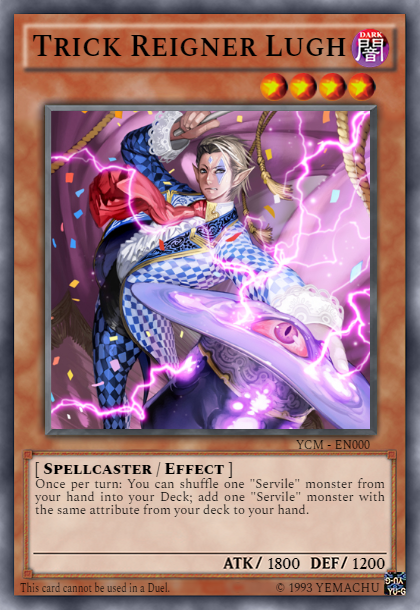 While you control a "Servile" monster, your opponent cannot Flip Summon or activate Set cards. If this card would be destroyed: destroy 1 "Servile" monster instead. 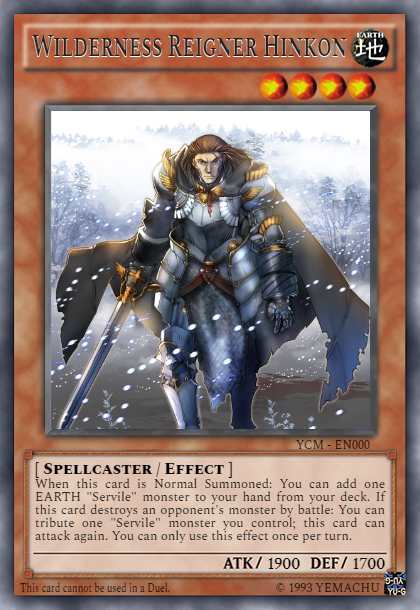 If you control a DARK "Reigner" monster, you can Tribute 1 "Servile" monster to Special Summon this card from your hand. Once per turn: You can target 1 card your opponent controls; banish it, then this card loses 500 ATK. If you control a "Reigner" monster: You can Special Summon this card from your hand. When this card is Summoned: You can Special Summon any number of "Servile Imps" from your GY. 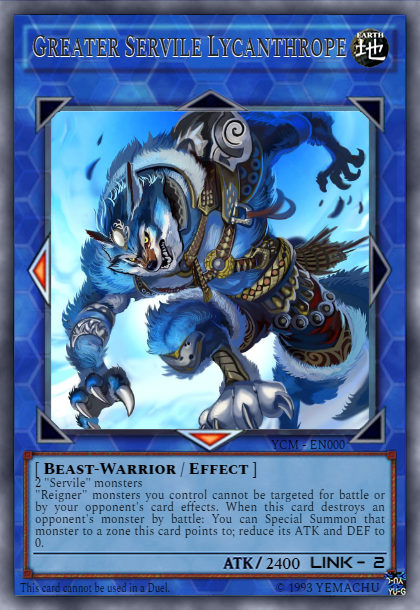 "Reigner" monsters you control cannot be targeted by battle or by your opponent's card effects. When this card is Summoned: Target 1 "Reigner" or "Servile" monster in your GY; this card gains ATK equal to that target's ATK. Once per turn: You can target 1 "Servile" monster in your GY; banish it, and if you do, this card gains its effects until the end of this turn. 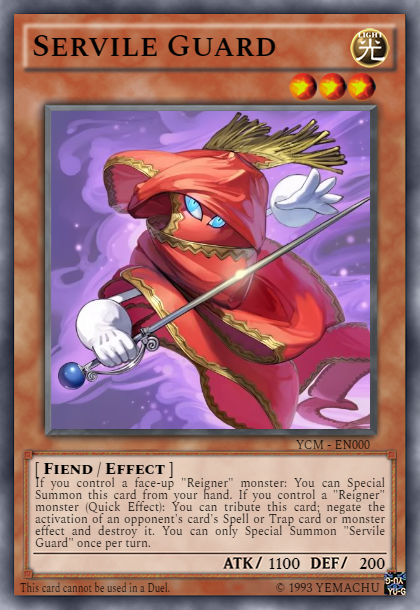 "Reigner" monsters you control cannot be targeted by battle or by your opponent's card effects. If your opponent controls 2 or more monsters, for each monster your opponent controls, this card gains 1 additional attack during each Battle Phase. 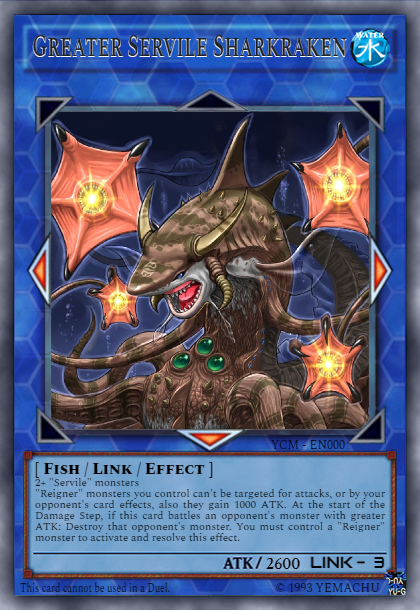 If this card attacks an opponent's monster, your opponent cannot activate cards or effects until the end of the Damage Step. 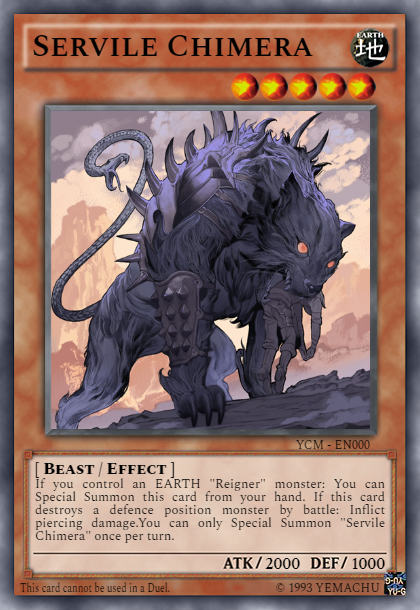 If you control an EARTH "Reigner" monster: You can Special Summon this card from your hand. If this card destroys a defence position monster by battle: Inflict piercing damage.You can only Special Summon "Servile Chimera" once per turn. If you control a "Reigner" monster: You can Special Summon this card from your hand. 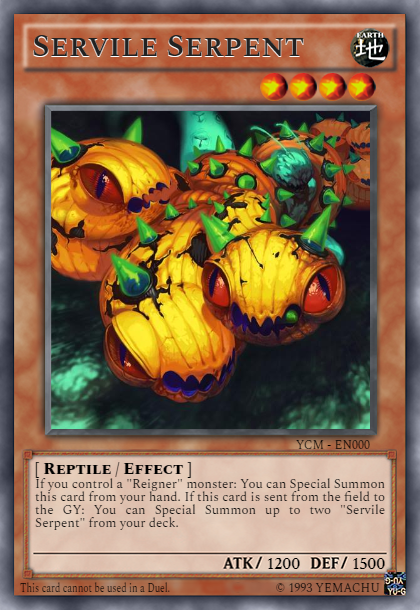 If this card is sent from the field to the GY: You can Special Summon up to two "Servile Serpent" from your deck. 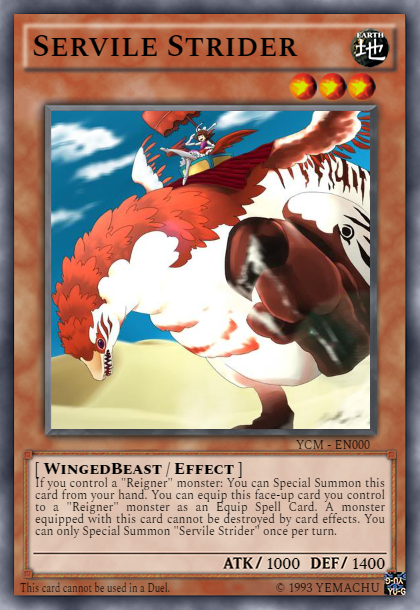 If you control a "Reigner" monster: You can Special Summon this card from your hand. You can equip this face-up card you control to a "Reigner" monster as an Equip Spell Card. A monster equipped with this card cannot be destroyed by card effects. You can only Special Summon "Servile Strider" once per turn. 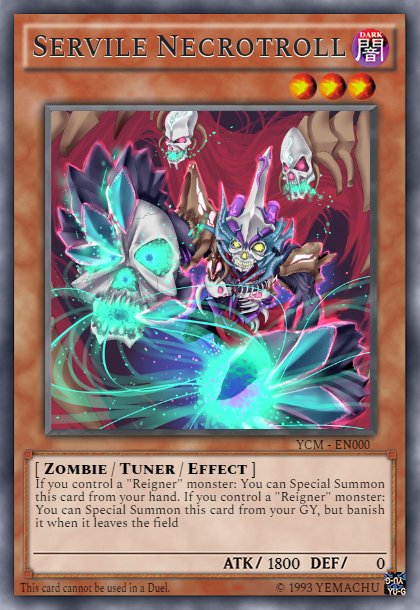 "Reigner" monsters you control cannot be targeted for battle or by your opponent's card effects. When this card destroys an opponent's monster by battle: You can Special Summon that monster to a zone this card points to; reduce its ATK and DEF to 0. 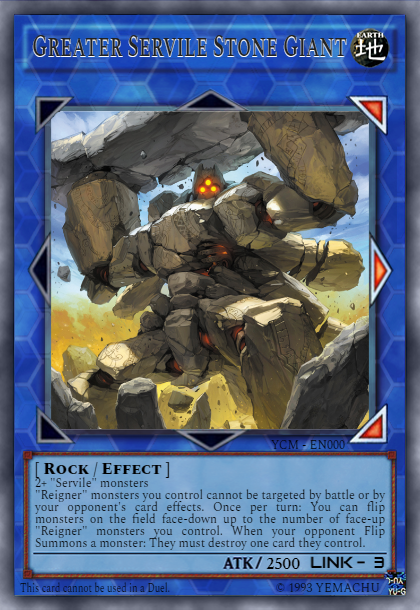 "Reigner" monsters you control cannot be targeted by battle or by your opponent's card effects. Once per turn: You can flip monsters on the field face-down up to the number of face-up "Reigner" monsters you control. When your opponent Flip Summons a monster: They must destroy one card they control. 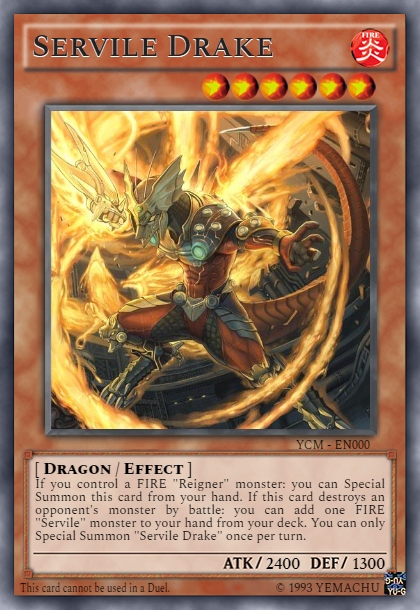 If you control a FIRE "Reigner" monster: you can Special Summon this card from your hand. 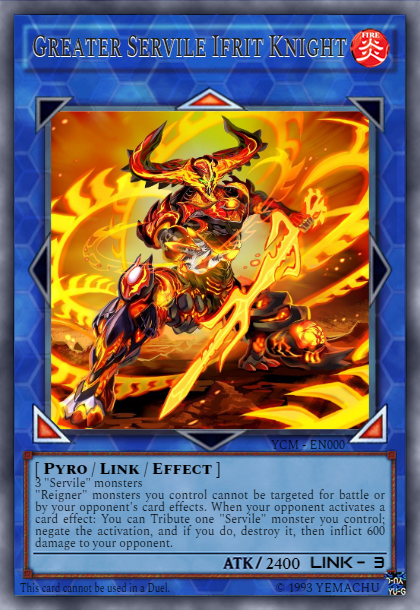 If this card destroys an opponent's monster by battle: you can add one FIRE "Servile" monster to your hand from your deck. You can only Special Summon "Servile Drake" once per turn. If you control a "Reigner" monster: You can Special Summon this card from your hand. When this card attacks a monster your opponent controls: You can change that card's battle position, and if you do, add one "Servile" monster with lower ATK than that card from our deck to your hand. You can only Special Summon "Servile Leo" once per turn. If you control a "Reigner" monster: You can Special Summon this card from your hand. This card can attack your opponent directly. If this card inflicts damage on your opponent: You can destroy 1 Set card on the field. You can only Special Summon "Servile Lizard" once per turn. 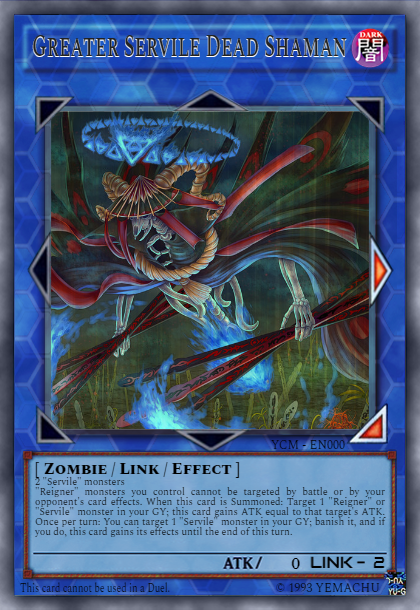 "Reigner" monsters you control cannot be targeted for battle or by your opponent's card effects. 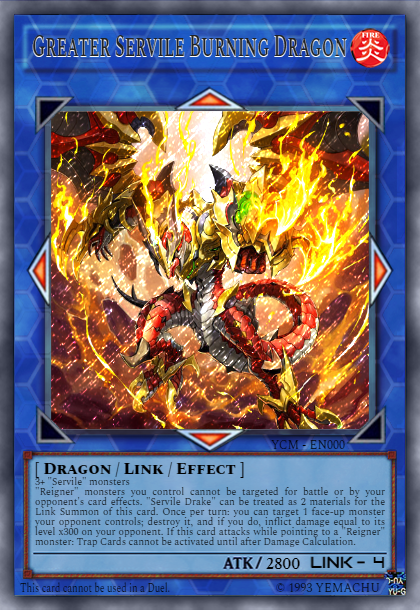 "Servile Drake" can be treated as 2 materials for the Link Summon of this card. Once per turn: you can target 1 face-up monster your opponent controls; destroy it, and if you do, inflict damage equal to its level x300 on your opponent. 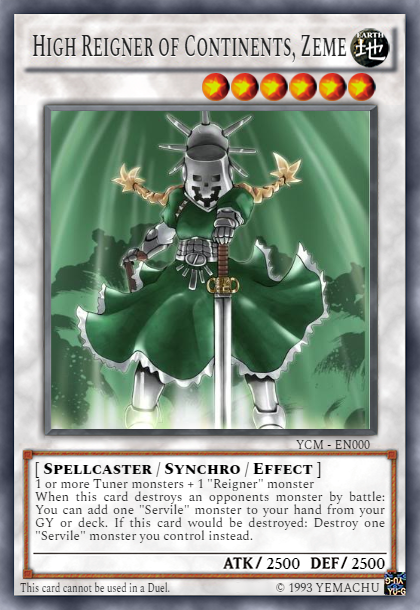 If this card attacks while pointing to a "Reigner" monster: Trap Cards cannot be activated until after Damage Calculation. 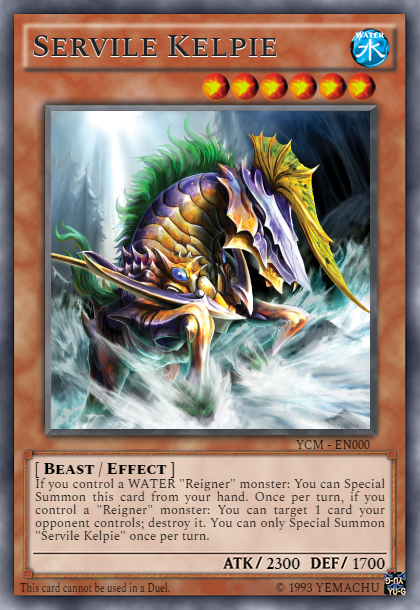 "Reigner" monsters you control cannot be targeted for battle or by your opponent's card effects. When your opponent activates a card effect: You can Tribute one "Servile" monster you control; negate the activation, and if you do, destroy it, then inflict 600 damage to your opponent. 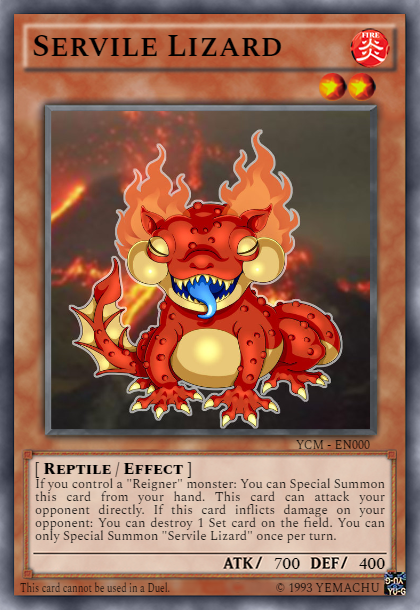 If you control a face-up "Reigner" monster: You can Special Summon this card from your hand. If you control a "Reigner" monster (Quick Effect): You can tribute this card; negate the activation of an opponent's card's Spell or Trap card or monster effect and destroy it. You can only Special Summon "Servile Guard" once per turn. 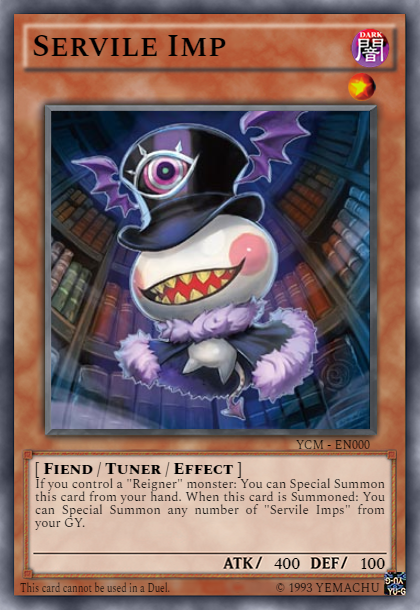 If you control a face-up "Reigner" monster: you can Special Summon this card from your hand. 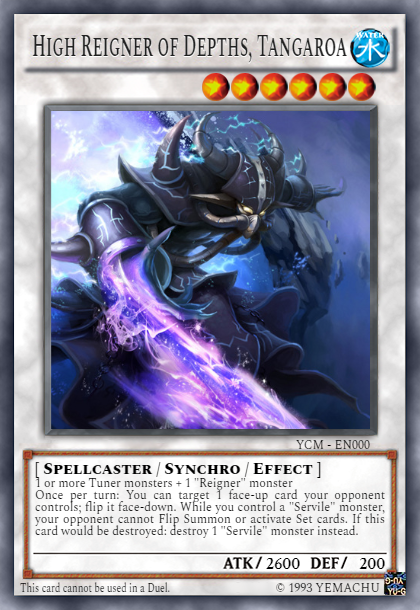 When this card is summoned by its own effect: you can add one "Servile" or "Reign" card from your deck to your hand. You can only Special Summon "Servile Hound" once per turn. If you control a LIGHT "Reigner" monster: you can Special Summon this card from your hand. Each Standby phase, if a "Reigner" monster is on the field: increase your LP by 400 for each "Servile" monster you control. When your opponent activates a card effect: you can tribute this card; return one "Reigner" monster you control to your hand. You can only Special Summon "Servile Unicorn" once per turn. 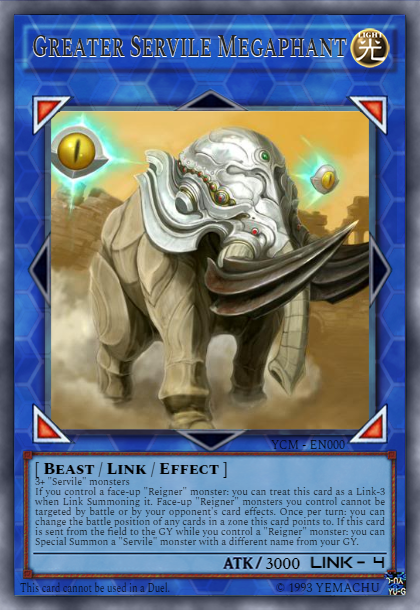 If you control a face-up "Reigner" monster: you can treat this card as a Link-3 when Link Summoning it. Face-up "Reigner" monsters you control cannot be targeted by battle or by your opponent's card effects. Once per turn: you can change the battle position of any cards in a zone this card points to. 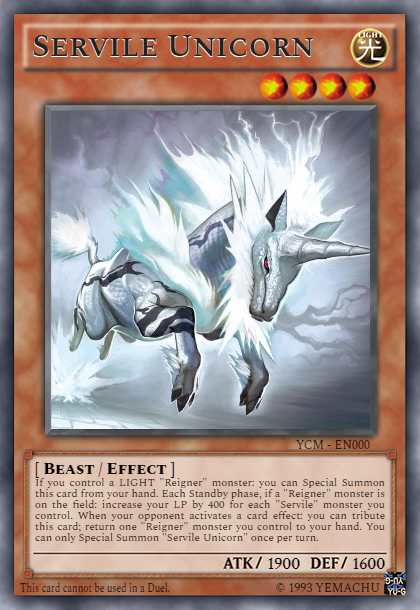 If this card is sent from the field to the GY while you control a "Reigner" monster: you can Special Summon a "Servile" monster with a different name from your GY. 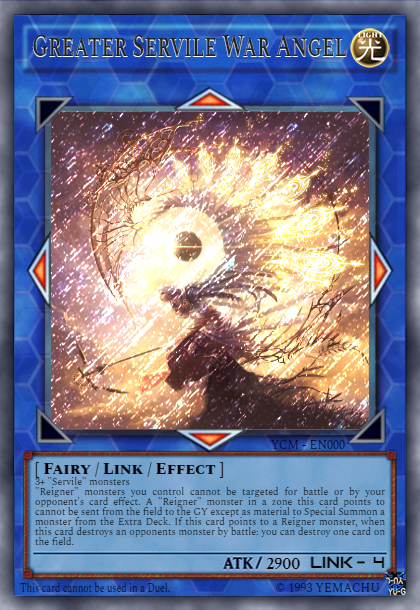 "Reigner" monsters you control cannot be targeted for battle or by your opponent's card effect. A "Reigner" monster in a zone this card points to cannot be sent from the field to the GY except as material to Special Summon a monster from the Extra Deck. If this card points to a Reigner monster, when this card destroys an opponents monster by battle: you can destroy one card on the field. If you control a "Reigner" monster: You can Special Summon this card from your hand. Once per turn: You can increase the Levels of all "Reigner" monsters you control by 2 until the end of this turn. 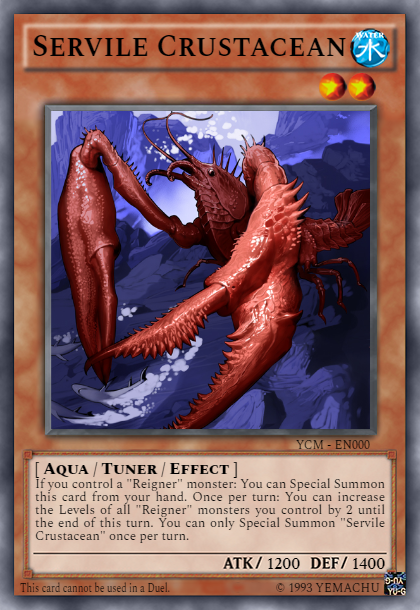 You can only Special Summon "Servile Crustacean" once per turn. If you control a "Reigner" monster: You can Special Summon this card from your hand. 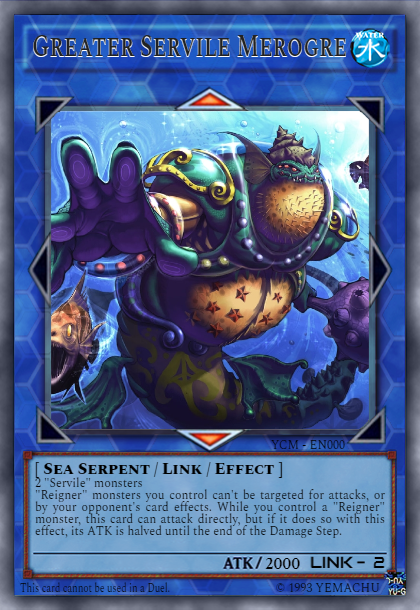 Once per turn, if you control a WATER "Reigner" monster: You can shuffle this card into the Deck; Special Summon 2 Level 3 or lower "Servile" monsters from your Deck, except "Servile Frog". You can only Special Summon "Servile Frog" once per turn. 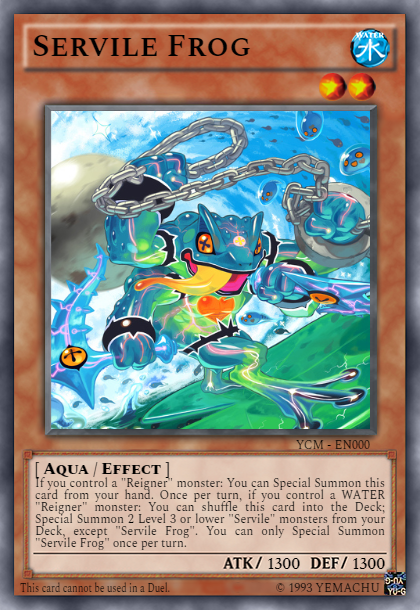 If you control a WATER "Reigner" monster: You can Special Summon this card from your hand. Once per turn, if you control a "Reigner" monster: You can target 1 card your opponent controls; destroy it. You can only Special Summon "Servile Kelpie" once per turn. "Reigner" monsters you control can't be targeted for attacks, or by your opponent's card effects. While you control a "Reigner" monster, this card can attack directly, but if it does so with this effect, its ATK is halved until the end of the Damage Step. "Reigner" monsters you control can't be targeted for attacks, or by your opponent's card effects, also they gain 1000 ATK. At the start of the Damage Step, if this card battles an opponent's monster with greater ATK: Destroy that opponent's monster. You must control a "Reigner" monster to activate and resolve this effect. I'll be uploading the light attribute ones next. Thanks to Kano who helped me get the PSCT right. Fire monsters have all been added. All Earth monsters now added. that leaves light, wind and a handful of support spells/traps.